I’ve had the very great pleasure and privilege of attending a few interesting dinners in recent weeks, one of which even tiptoed towards greatness, while another edged uncomfortably towards the other end of the qualitative scale before rescuing itself heroically. 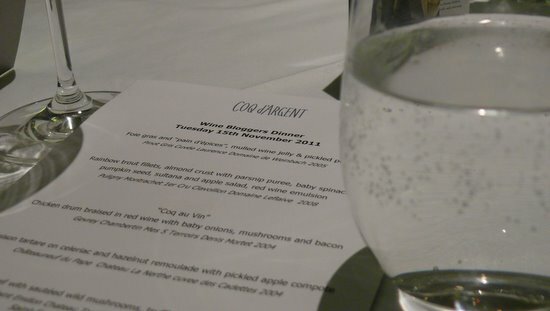 The former was at Coq d’Argent, a fairly fancy restaurant which caters for city types, situated as it is close to the Bank of England on Poultry, among the best-named streets in London and inspiration for the first half of the restaurant’s name. So far as I can see, the only possible complaint about this place is the prices – mains start at £19 and trundle gently upwards towards an offputting £34, though there’s a seven-course menu dégustation (which counts sorbet and pre-dessert as courses in their own right, and thus is really a five-course tasting menu with bonuses) which looks like something of a bargain at £48. Some of the food we ate was exceptional – a fillet of beef with sauteed wild mushrooms, truffle and pan fried foie gras was possibly the best dish I’ve been served this year – and some of the wine stonkingly delicious. We’d been brought there to investigate the restaurant’s enomatic machine, which allows them to serve some seriously fine wine by the glass. It doesn’t make these wines cheap – from their current selections a 175ml glass of wine, which the pub chain Wetherspoon’s would define as “small”, costs between £19.50 and £45.50 – but it does make them vaguely achievable. I’d love to try Chateau d’Yquem, but given that Le Coq sells bottles for anything between £215 (for the 2003) and £7,000 – that’s seven thousand pounds – (for the 1921), and the cheapest I can find it anywhere else is £94.95 for half a bottle, I’m not about to do it any time soon. If it were in the enomatic machine I’d probably still blanche at the price of a full glass, but I would be able to try a 25ml sip for less than a tenner. Machine aside the wine list, compiled by Olivier Marie, their head somelier of 10 years’ standing, is good enough to have been named the best in the country earlier this year. It’s quite long, and I’m sure it would absolutely terrify a novice, but there are some interesting wine facts scattered among the pages, some low mark-ups on the top-end wines, and even if you know your wine you’re probably best off just asking Olivier what you should get anyway. The man knows his stuff. Before the dinner I was told that I’d be trying some very big names – Yquem, for a start. They never came, but then anyone can say that Yquem is likely to be a decent wine; Marie thought a 1989 Philippe Foreau Vouvray moelleux would be better with our dessert, and it was utterly splendid. With that beef fillet Marie proposed a 1995 Chateau Troplong Mondot (available online for £81 a bottle; on the wine list for £179); Tom Harrow, aka the Wine Chap, who was co-hosting the dinner, quite fancied a 1996 Chateau Montrose (available online for £133 a bottle; on the wine list for £185) instead. In the end we got both, but the St Emilion was by far the better match (I didn’t get on that well with the Montrose, which had an overwhelming and one-dimensional aroma of pencil-shavings). The vouvray was probably my wine of the night, though a 2005 pinot gris Cuvee Laurence from Domaine Weinbach (available by the case online for £29 a bottle; on the wine list for £83 a bottle) was another stunner, and with its zingy acidity and raisined but gentle sweetness made a brilliant match for foie gras terrine. Le Coq d’Argent is in the city, and is always likely to have lots of suited bankers filling its tables. It comes at a price which only the extravagantly bonused might consider inexpensive, but they offer some of the best non-Michelin-starred cookery in the land, and a great wine list. In addition to the enomatic machine they have a small selection of themed two-glass wine flights – it’s that kind of stuff which makes drinking wine in restaurants, for all their often galling mark-ups, worth doing. I recommend it heartily, if you’re in the area and feel a bit flush. You can read my fellow diner Tara Devon O’Leary more forensic account of the meal here, if you wish. 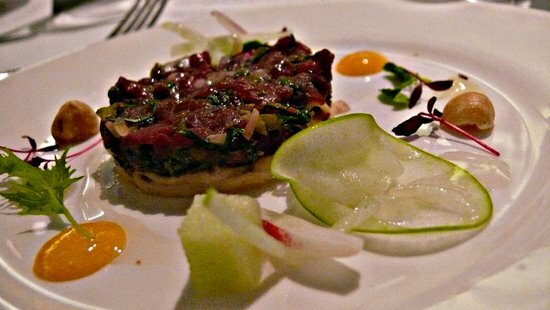 On, then, to a very different meal at Clerkenwell’s Argentinian restaurant A La Cruz. Among the worst possible destinations for a first date with a vegetarian, this place is all about its asador, a charcoal pit over which meat slowly roasts. They take this so seriously they ship the wood over from Argentina, because nothing we’ve got does the job quite so well. The side dishes we got with our meat – a few sad potatoes; a couple of lettuce leaves and a large pile of red onion – suggests that protein is the priority here. 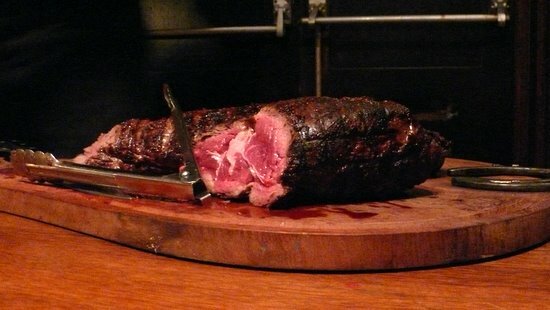 We got lots of it; first we shared an entire beef fillet and a rib-eye, the latter by the chef’s own admission rather undercooked. What’s more, the chef’s portioning was so out of kilter that several people still hadn’t been served by the time the fillet was finished, and had to hang around for a while until someone seared them a steak. 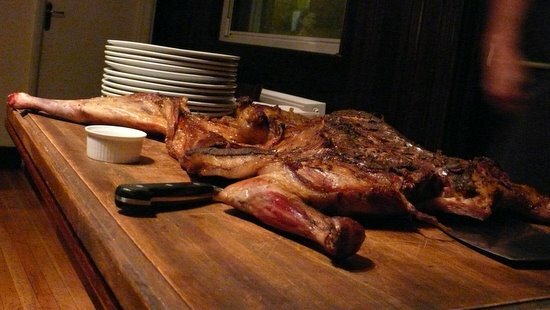 On the plus side, this meant that everyone got a very generous portion of meat. And then, when we had finished that, we shared an entire lamb. This little beast had been cooked long and slow on the asador, in the manner any visitor to Patagonia might have witnessed, and the results were sweet and tender. Anyone with a love of the dramatic and enough like-minded friends to stage a large-scale meat blow-out could do a lot worse than pre-order their cordero entero. They make a very good chimichurri, which is something we don’t see often enough, and the meat is obviously of a very high standard (though to my mind it could have been a bit more liberally seasoned). A La Cruz has impeccable heritage, sharing an owner with Broadway Market’s excellent Buen Ayre, and makes a very good place for a meaty blow-out, though still a rung or two below Hawksmoor standards. I used to work a couple of minutes’ walk from here, and saw a couple of restaurants open on this site only to close soon afterwards. It’s a difficult location, very close to trendy Exmouth Market but far enough away for nobody to actually walk past very often. Let’s hope this one, which was pretty full on the weeknight I visited, bucks the site’s unhappy trend. We drank, incidentally (and everything but the meat was incidental), a couple of wines from Luigi Bosca. His Gala 2, a Bordeaux blend of cabernet sauvignon, cabernet franc and merlot, was big, smooth and ripe-fruited to an almost unpleasant degree, although some people will love it. 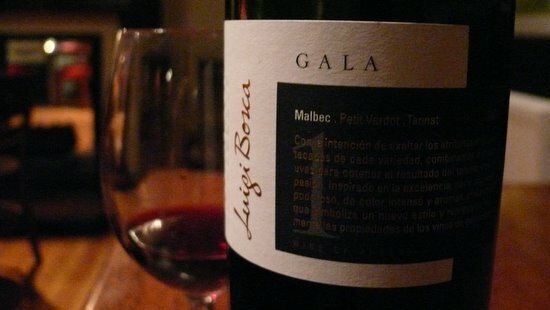 Gala 1, a blend of malbec, petit verdot and tannat, was considerably superior, for the same price. Anyway, enough about posh stuff. My next post, comin’ atcha later this week, is about Cono Sur pinot noir.